What's New at Wear Earrings Again with Maggie's Creations - Non-Allergenic Jewerly, guaranteed! On this page you can see What's New. REFRESH YOUR BROWSER so you can see the new items! Click on the pictures to go to the page where the item is for sale. All earrings have Niobium or Titanium posts so that only these elements touch your skin. Earrings with alloys on them (not against the skin) are recommended for healed piercings and daytime wear only. NOTE: It may take some time to aquire the supplies needed to make "custom made to order" jewelry for you. Please read my GUARANTEES & POLICIES page for more information. Kids Pure Niobium Plastic Flowers Change-able Earrings. 6mm Plastic Flowers fit right onto my Niobium Dot Posts. 21 gauge. So Cute! Unanodized (natural gray color) Niobium (Nb) or Anodized Niobium (bright vivid colors). Fantastic "change-able" earrings that you can remove and replace flowers for a whole new look. Extra flowers are available below (seperately). Clutches are included. Perfect starter/sleeper/healing earrings Available with "Regular" post lengths, unless you say otherwise in the note section of my checkout page. You can ask for "Long" post lengths, or you can order your posts to fit you custom (no extra charge). You don't have to be a performer to shine like the stars!! Beautiful 6mm Chessboard Crystals are epoxy set onto Pure Grade Titanium posts and pad settings, and embellished with beautiful 12mm crystal studded frames in silvertone metal. Clutches are included. Titanium earrings come with standard post lengths. Email me for prices of custom made Titanium or Niobium settings in any size post length. Minimalist earrings are very popular, and I've created these earrings after many custom requests. Earrings are hand made from wire, Bar is approximately 9mm (3/8ths inch) long . Unanodized (natural gray color) Niobium (Nb) or Titanium (Ti) your choice. Perfect starter/sleeper/healing earrings Available with "Regular" or "Long" post lengths ... or, order your posts to fit you custom (no extra charge), in the "Earlobe Thickness" drop down box, below. Clutches are included. Titanium (Ti) or Niobium (Nb) Earpins. Platinum over Silver for that fine "white gold" look. These earrings are 4mm thick and 5/8ths inch in diameter. CZ's are channel set on the front outside and back inside of the hoops, so that others looking at you see all of the CZs! Your choice of Titanium or Niobium Earpins, so only pure elements touch your sensitive skin! Very pretty and well made earrings. Recommended for daytime/dry wear only. Your choice of 6mm (1/4 inch), 8mm (5/16ths inch), or 10mm (3/8ths inch), 11mm (7/16ths inch), and 13mm (1/2 inch) inside diameter sizes. Smaller sizes are perfect for cartilage piercings. Perfect to put in and leave in. Anodized in vivid colors is availabe, email me for details. Sold here by the pair, but email me if you only need a single. Platinum over Silver for that fine "white gold" look. These earrings are 3mm thick and 3/4 in long from the piercing by 1/2 inch wide. CZ's are channel set on the front outside of the hoops. Your choice of Titanium or Niobium Earpins, so only pure elements touch your sensitive skin! Very pretty and well made earring. Recommended for daytime/dry wear only. Available in 3 sizes!! 3/4 inch, 1 inch, and 1+1/3 inch! Your choice of matching Titanium or Niobium earpin/posts so nothing but Non-allergenic elements touch your sensitive skin! Snaps to close. Best for healed piercings and daytime wear only. Beautiful, high polished shine, affordable alternative to silver which will never fade! 3mm or 4mm thick Sterling Silver Tube Hoop Earrings. MORE SILVER! Perfect All Occasion Classic Hoop heavier and more substantial hoop earrings. Snaps closed. Has unanodized Titanium or Niobium Ear Pin/Post (your choice) so that nothing but Non-allergenic Elements touch your sensitive skin! Available in 3/4 inch to 1+1/3 inch sizes, but other sizes available upon request. Best for healed piercings and daytime wear only. Sizes are limited to availability. Your choice of 8mm (5/16ths inch) or 10mm (3/8ths inch) sizes. Smaller size is perfect for cartilage piercings. You can order these anodized golden or natural silver/gray tone. Available here by the pair, but email me if you only need a single. Wear them entered through the back of the piercing (to show a plain snuggie hoop from the front) or wear them entered through the front of the piercing (to show a dot and half hoop). with Pure Grade Titanium barrel clutch. Perfect to wear alone or with a charm or pendant. Your choice of 1.5mm Ball Chain or 2.5mm Ball Chain is in stock and available. Many different styles of chains are also available. Buy them by the inch to get a completed custom length bracelet or necklace. Many beautiful pendants and charms are also available for your new chain! Email me for more information. Pure Titanium or Niobium Cupped Glass Flowers Change-able Earrings. Even More, NEW COLORS Dec 2018! 7mm Cupped Glass Flowers fit right onto my Titanium (Ti) or Niobium (Nb) Dot Posts. 21 gauge. So Cute! Unanodized (natural gray color) Niobium (Nb) or Titanium (Ti) or Anodized Niobium (bright vivid colors). Fantastic "change-able" earrings that you can remove and replace flowers for a whole new look. Genuine Agate All Titanium (Ti) or Niobium (Nb) Wire-work Earrings! Tiny little 2mm genuine colorful Agate beads hand strewn on all Titanium or Niobium metallic elements - hand forged wire work dangle earrings! Earrings hang @ 1+5/8 inch from piercings and are approximately 3/8 inch wide at widest point. Absolutely nothing to cause allergic reaction in or on these earrings at all! Shown in Titanium. Very unique. 15mm Peacock Saucer Pearls Earrings! Have you ever seen pearls like these? Pictures do no justice - I just can't get good pictures that show the great colors. 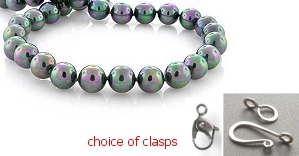 These are really cool 15mm wide (little more than a half inch) Peacock Pearls with brilliant blues, purples, reds, greens, raven wing colors! Choose 2 set or 3 set pearl earrings. Shown are 3 pearl sets with golden wire-work and matching anodized golden Niobium hooks in natural sunlight. Also available is silver with matching Niobium or Titanium hooks. Very ornately detailed - dramatic - must see close ups! Your choice of oxidized Silver or oxidized Brass Drops with matching Titanium or Niobium hooks. Earrings hang about 1+3/4 inches from the piercing and are @ 3/8 inch wide at the widest point. Click on picture for close up and detailed view. 3mm Solid Surgical Implant Grade Titanium Post and Ball Earrings! Simple - Classy - Forever Earrings! Natural silver-gray tone solid Titanium (anodized colors are available upon request). Standard length posts. Clutches are included. Surgical Implant Grade Titanium (ASTM F136) can be worn by all who have achieved healthy piercings - but I do not recommend it for piercings currently suffering with Eczema. Kid's Pure Titanium or Niobium Glass Flowers Change-able Earrings. 5mm Glass Flowers available in many colors - fit right onto my Titanium (Ti) or Niobium (Nb) Dot Posts. 21 gauge. So Cute! Unanodized (natural gray color) Niobium (Nb) or Titanium (Ti) or Anodized Niobium (bright vivid colors) Dot Post Earrings. Fantastic "change-able" earrings that my Girls can remove and replace flowers (which they love to do) for a whole new look. Extra flowers are inexpensive and available below (additionally). Clutches are included. Perfect starter/sleeper/healing earrings Available with "Regular" post lengths, unless you say otherwise in the note section of my checkout page. You can ask for "Long" post lengths, or you can order your posts to fit custom (no extra charge). Itty Bitty. 1.5mm cz/crystals bezel set (no glue) into solid one piece Implant Grade Titanium. Choose a Regular/Standard post length (which will fit up to a 7mm earlobe thickness), or Long (which will fit up to 10mm) on regular style post earrings. Or you can request a custom sized post length if you prefer. Rubber Clutches are included. * For Earscrews please specify specific earlobe thickness in the note section of the checkout page. For J-screws please specify regular or long post lengths in the note section of the checkout page. Swarovski CZ/Crystal in Surgical Implant Grade Titanium 3mm Ball Settings. Unique and perfect forever earrings. Very nice sparkle - pictures do no justice. 3mm SI Titanium Balls with CZ/Crystals bezel set (no glue). Available with Diamond Crystal, Crystal AB, Rose Pink, Peridot Green, Tanzanite Purple and Blue Zircon CZ/Crystal colors. Surgical Implant Grade Titanium (ASTM F136) can be worn by all who have achieved healthy piercings - but I do not recommend it for new piercings or piercings currently suffering with Eczema. Delicate Gold Clad Hoop Earrings measure about 1 inch from piercing and are 3mm wide, with beautiful 1mm CZs in an eternity design. Anodized golden Niobium pin/posts to match, so only pure elements touch your sensitive skin. Snap down closure makes them easy to put on and take off. The look of fine gold without the high pricetag. Recommended for healed piercings and daytime dry-wear only. More substantial than above, Gold Clad Hoop Earrings measure about 1 inch from piercing and are 4mm wide, with six beautiful 2mm CZs on the fronts of the hoops. Anodized golden Niobium pin/posts to match, so only pure elements touch your sensitive skin. Snap down closure makes them easy to put on and take off. The look of fine gold without the high pricetag. with Titanium (Ti) or Niobium (Nb) Earpins. Hollow Surgical Steel Hoops (are light weight) in a pretty Heart shape, are studded with 5 beautiful little CZ Crystals. The hoops are fashioned in a Left and Right design, so that the CZ sides face outward on both ears. Snap down closure make them secure, yet easy to put on and take off. They hang about 1+1/3 inch from the piercings, and have your choice of Titanium or Niobium Earpins, so only pure elements touch your sensitive skin! Shiny & Super Classy!! Small, under 3/4 inch in diamter, 5mm wide hoop earrings with anodized golden Niobium earpins to match nothing but Non-allergenic elements sit on your sensitive skin!. Snap down to close. Shiny & Very Pretty!! Another small, @ 3/4 inch in diamter, 2.5mm wide hoop earrings with anodized golden Niobium earpins to match nothing but Non-allergenic elements sit on your sensitive skin!. Snap down to close. Shiny & Very Nice!! Earrings are just over 3/4 inch in diamter with 2mm wide tubes. Anodized golden Niobium earpins to match so that nothing but Non-allergenic elements sit on your sensitive skin!. Snap down to close. Larger, @ 1+1/3 inch in diamter by 2mm wide and 4mm deep. Anodized golden Niobium earpins to match so that nothing but Non-allergenic elements sit on your sensitive skin!. Snap down to close. This is a heavier hoop earring that would be best on completely healed piercings. Heavy Gold Dipped jewelry does not have as much karat gold as Gold-Filled does, but has far more than Gold Plated jewelry. Gentle care will provide for a long lasting shine. Recommended for healed piercings and daytime dry-wear only. 7mm Cupped Glass Flowers fit right onto my Titanium (Ti) or Niobium (Nb) Dot Posts. 21 gauge. So Cute! Unanodized (natural gray color) Niobium (Nb) or Titanium (Ti) or Anodized Niobium (bright vivid colors). Fantastic "change-able" earrings that you can remove and replace flowers for a whole new look. Extra flowers are available below (seperately). Clutches are included. Pure Grade-2 Titanium (Ti) & Pure Niobium (Nb) ALL NEW Pearl Earrings! Come see all my GREAT new pearl earrings, set on Pure Titanium and Niobium. Top Quality, and Everyday Pearls available. Classic White or All New Colors! Made of PURE GRADE-2 TITANIUM. Unanodized (natural gray color). Clutches are included. Perfect starter and sleeper earrings! Standard sized posts will fit up to a 7mm earlobe thickness. My Starter/Sleeper/Healing Earrings come with my Non-Allergenic Care Instructions, and the price includes my Full Professional Follow Up Services. Just look at the colors and mirror shine of these exceptionally lustrous pearls! You can see my reflection in them when I took the pictures! Substantial 8.5mm size in an off round shape Cultured Freshwater Pearls (CFP) make them perfect for dangle earrings. A must have for your top-quality Non-allergenic Earrings collection! Shown are 3 pearl sets with Gold Beads on matching golden Niobium hooks. Also available is Silver with matching Niobium or Titanium hooks. 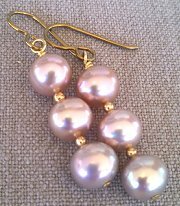 You can also order earrings with just 2 pearl sets - for the office or daytime wear. 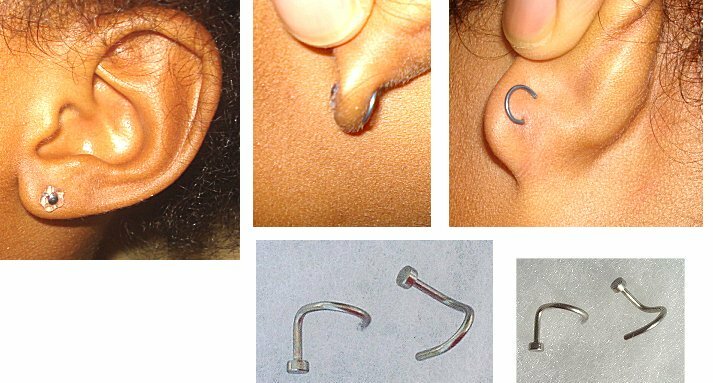 Petite- perfect for second or third multiple piercings. Very nice earrings - Great sparkle! 2mm cz/crystals bezel set (no glue) into solid one piece Implant Grade Titanium. Rubber Clutches are included. Implant Grade Titanium (ASTM F136) can be worn by all who have achieved healed piercings - but I do not recommend it for new piercings or piercings currently suffering with Eczema. Also available on my Kid's Page. 3mm Crystals in 4mm Surgical Implant Grade Titanium Prong Settings. Prong Set CZs !! Very pretty & classy. 3mm stones are prong set in SI Titanium prong settings (no glue). Available in diamond CZ Color. Post lengths fit up to an 8mm earlobe thickness (standard size fits up to 7). Surgical Implant Grade Titanium (ASTM F136) can be worn by all who have achieved healed piercings - but I do not recommend it for new piercings or piercings currently suffering with Eczema. Swarovski CZ/Crystal in Surgical Implant Titanium 3mm Ball Settings. Unique and perfect forever earrings. Very nice sparkle - pictures do no justice. 3mm SI Titanium Balls with diamond CZ/Crystals bezel set (no glue). Standard post lengths will fit up to a 7mm earlobe thickness. Clutches are included. Beautiful Classy Goldfilled Hoop Earrings measure about 3/4 inch from piercing (1/2 inch across). Anodized golden Niobium pin/posts to match, so only pure elements touch your sensitive skin. Snap down closure makes them easy to put on and take off. For healed piercings and daytime/dry-wear only. Swarovski Crystal in Implant Grade Titanium anodized golden. Petite- perfect for second or third multiple piercings. 2.5mm crystals bezel set (no glue) into solid one piece Implant Grade Titanium, anodized golden. Available in Pink, Purple, or Pale Blue Crystals! Standard post lengths will fit up to a 7mm earlobe thickness. Rubber Clutches are included. ONLY PINK IS LEFT. 4mm CZs are prong set in SI Titanium prong settings. Available with Light Pink, Light Green, Aqua, Blue Zircon, and Purple Gem CZs. Post lengths fit up to an 8mm earlobe thickness (a little longer than standard). Clutches are included. Unique and perfect for kids or adults. 3mm Anodized golden SI Titanium Balls with crystals bezel set (no glue). Available with Diamond Crystal color (other crystal colors and unandized natural titanium coming soon - you can pre-order them by emailing me). Standard post lengths will fit up to a 7mm earlobe thickness. Clutches are included. Unique and perfect for kids or adults. 4mm SI Titanium Balls with crystals bezel set (no glue). Available with Crystal AB, Rose, Peridot, Tanzanite and Blue Zircon crystal colors (Diamond Crystal will be available soon - you can pre-order by emailing me). Beautiful Genuine Misty Green Fluorite Briolettes on All Niobium (Nb) or Titanium (Ti) Metallic Elements! Available in natural gray/silver-tone Titanium or Niobium. Earrings hang @ 1.75 inches from the piercings. Completely Non-Allergenic! Beautiful & Fun Cultured Sea Glass Bobble Earrings. Frosted Aqua Bobbles measure 14mm wide coupled with ALL Pure Titanium (Ti) metallic elements, including the hand made bead caps! Earrings hang just under 1+1/4 inches from the piercings and are less than a 1/2 inch wide at the widest points. Choose Niobium or Titanium hooks, your choice. Beach glass jewelry is very hot right now, and these are made completely safe just for you! Beautiful Crystals are epoxy set onto Pure Grade Titanium post and pad settings. Earrings are the style and size that many performance instructors require their girls to wear. Titanium clutches are included. Will fit an average earlobe thickness. Earrings which are epoxy set should not be soaked/worn in water, or the cement could loosen and the crystal fall off of the setting. or Necklace on All Titanium (Ti) or Niobium (Nb) Metallic Elements!! 10mm South Sea SHELL Pearls protected by tiny rubber bumpers, with your choice of Niobium or Titanium Hand-made Clasps. 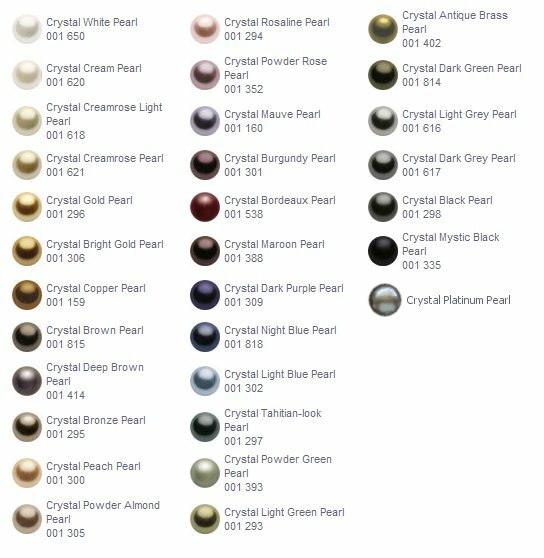 White, Gold, Silver, Tahitian/Black or Peacock pearl colors are available. Other colors by request. Titanium Lobster clasp available for an additional charge, email me for details. South Sea Shell Pearls are man made pearls, they are created using the same nacre (from the inside of the shell) that genuine south sea pearls are taken from. They are perfectly round gorgeous yet much less expensive look alike pearls! Bracelet or Necklace by the inch. Top Quality Genuine Carnelian on All Niobium (Nb) or Titanium (Ti) Metallic Elements! Just look at the color and quality of these beauties. Available in natural gray/silver-tone Titanium or Niobium, or anodized golden Niobium, your choice. Choose Long or Short designs. Long earrings hang @ 1.75 inches from the piercings and short earrings hang about 1.25 inch from the piercings. Beautiful 12mm Silver Balls completely encrusted with pave set diamond clear Crystals and set on Pure Grade Titanium Post and Cup settings. Lots of sparkle and shine makes them fit for that elegant special occassion. Posts will fit a regular earlobe thickness (up to 7mm). Earrings come with rubber clutches - get extra (available at bottom of this page or on my rubber page) and replace them monthly to keep the fit nice and tight. Only 1 pair available at this time. Beautifully beaded Dreamcatcher earrings in your choice of Teal or Blue dominant colors. Matching Titanium (Ti) or Niobium (Nb) hooks makes them safe and comfortable for you to wear. Earrings hang about 2.5 inches from the piercings and are about 3/4 inch wide at the widest point. Best for daytime/dry-wear only. Limited supply! Sun, Surf & Sand Beach Jewelry! Beautiful Cultured Sea Glass Drop Earrings. Frosted White, Frosted Lavender and Frosted Green Coke Bottle colors hand wire-wrapped together in a unique design. ALL Titanium (Ti) or Niobium (Nb) metalic elements! Earrings hang @ 1.5 inches from the piercings and are 1/2 inch wide at the widest points. Hot, and made completely safe just for you! Beautiful Cultured Sea Glass Drop Earrings available in Aqua with Sky Blue and White, or Aqua with Seafoam Green and Purple. Your choice of short or Long version. ALL Titanium (Ti) or Niobium (Nb) metalic elements! Natural Gray/Silver-tone Metallic Elements or Anodized golden, your choice! Short version earrings hang @ 1 inch from the piercings. Long version earrings hang @ 1.75 inches from the piercings. They are 1/3 inch wide at the widest point. Very beautiful, and made completely safe, just for you! Absolutely gorgeous! Top quality Champagne Cubic Zirconia in a Princess Cut, full of fire and sparkle, are hand wrapped in Pure Titanium Wire, and hang from Pure Titanium Kidney Hooks. Earrings hang @ an inch from the piercing. ONE PAIR ONLY. I will not be making more of these except by special request custom order, as they are very labor intensive. Get them while you can! @ 1/2 inch Small Gold Filled Hoop Earrings with openwork diamond cut out design. Anodized golden Niobium pin/posts to match make these pretty earrings safe for your sensitive skin! Recommended for daytime and dry-wear only. On sale while supplies last! Beautiful Cultured Sea Glass Stack Earrings available in Seafoam Green with Lavender or Aqua Blue with Lavender on ALL Titanium (Ti) or Niobium (Nb) metalic elements! Earrings hang @ 1 + inch from the piercings, and are almost 1/2 inch wide at the widest point. Very unique, beautiful, and made completely safe, just for you! 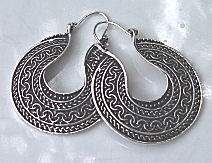 Ornate Silver-tone Fashion Hoop Earrings measure 1.5 inch wide and hang @ 2 inches long from the piercing. Beautiful Openwork Hoops. For healed piercings and daytime/dry-wear only. Titanium or Niobium Earpins to match, so only pure elements touch your sensitive skin! Big, Bold, and Beautiful Silver-tone Fashion Hoop Earrings measure 1.5 inch wide and hang @ 2 inches long from the piercing. Featuring a pretty outward facing design. Heavier Hoop Earrings are best for the well healed piercings and daytime/dry-wear only. Titanium or Niobium Earpins to match, so only pure elements touch your sensitive skin! Beautiful Emerald Green Flat Oval Gemstone beads are hand wire wrapped in your choice of anodized Golden Niobium or Natural (unanodized) Silver-tone Niobium. They are light weight and comfortable, and hang less than an inch from the piercing. The beads themselves are approximately 3/8 inch long. They are beautiful hand carved and polished gemstone beads. I purchased these beads long ago, and although they were advertised as genuine emerald, I do not believe they are (the price was too low to be genuine). They feel like jade or onyx to me - too soft to be emerald - but I am not sure exactly what they are. Still, they are a beautiful gemstone (not glass) in a gorgeouse shade of emerald green. Donuts are available in many beautiful colors, in 4mm or 6mm sizes. Change the Donuts for a whole new look! Extra Donuts are available to purchase seperately below. Perfect starter/sleeper/healing earrings! Clutch backs included. Posts will be made at a "regular" length, unless you request "long" or "custom" posts (no extra cost for custom fit). 4mm Round Charles & Colvard Moissanite in 4-Prong Titanium Earrings.. I am so excited to bring you Genuine Created Charles & Colvard Moissanite Titanium earrings!! 4mm Created Moissanite Gemstones have more sparkle (refraction) than the world's finest diamonds, is harder than diamonds, and cost but a fraction of diamonds. Believable diamond-size and even better quality, set in Pure Grade Titanium just for you! Titanium settings are manufactured Medical Compliant, and only Pure Grade Titanium touch the skin! Plated prongs are best for healed piercings and daytime dry-wear only. They will fit an earlobe thickness of up to 8mm, and Titanium clutches are included. Available in Gold Plated Prongs for $10.00 additionally. Email for more information. 4mm Round "Signity Star" CZ in 4-prong Titanium Earrings. These very special CZs are the highly coveted "Signity Star" CZ (highest quality in the world). This special cut is usually reserved for only the finest diamonds. This is the reason that the "Signity Star" sparkles like no other. Believable diamond-size and quality! 4mm Princess Cut Signity CZ Titanium Earrings. Super Premium Quality Signity colorless Cubic Zirconia in the most elegant Princess Cut. Believable diamond-size and quality set in Pure Grade Titanium just for you! Square cut gemstones are measured from flat side to flat side. A corner to corner measurement will be quite a bit bigger. 4mm Princess Cut Genuine Rainbow Moonstone in 4-prong Titanium Earrings. Genuine and Top Quality Rainbow Moonstone is rare, and I have only 1 pair in stock. What you see is the actual gemstones you get. Hurry - they won't last long at this price. Princess cut gemstones are measured from flat side to flat side (not corner to corner) - so the corner to corner measurement will be quite a bit larger. 4mm Round Lab Grown Rubies & Sapphires in Titanium Earrings. Oh my! Lab Grown Rubies & Sapphires have the identical chemical make-up as natural gems, without the imperfections! These gems are gorgeous and at a more affordable size and price. 4mm Cubic Zirconia and Simulant Gemstones on Titanium Earrings. Beautiful vivid and hard to find colors (some colors have limited availability). From top left to right: Swiss Blue Topaz CZ, Light Tanzanite CZ (1 pair), Dark Tanzanite CZ (1 pair), Emerald Simulant, Princess-Cut CZ, Round CZ, Cape Diamond (Pale Yellow) CZ, Canary CZ, Lavender CZ, Amethyst CZ, Pink CZ, Peridot CZ, Chocolate CZ, and Champagne CZ. Other colors and shapes are always available upon request. Other colors and shapes are always available upon request. Pure Grade Titanium (Ti) Shallow Cup & Post settings! I've designed this setting to be manufactured for me in Pure Grade Titanium - you can't get this earring in Pure Grade Titanium elsewhere! Many beautiful crystal colors to choose from. Clutches are included. Available in "Regular" or "Long" post lengths, OR get a "Custom" post length, for just $10.00 more. (choose your post length in the drop down box below). Also available with Niobium settings, email me for information. 6mm Round CZ in 4 prong Titanium Earrings. Just look at these gorgeous colors! These gemstone earrings will be custom created for you after you place your order. BIG & BEAUTIFUL! The 6mm Gemstones are about the size of a pencil eraser. Round: diamond-CZ, Champagne-diamond CZ, Fire Opal (Orange) CZ, Pink Sapphire CZ, Lavender Sapphire CZ, Tanzanite CZ, Emerald CZ, Canary-diamond CZ, Rhodonite CZ, Teal Indicolite CZ. Princess Cut: diamond-CZ, Champagne-diamond CZ colors! Titanium clutch backs are included. Brushed Gold Filled Cartier Hoop Earrings with Niobium (Nb) Earpins. 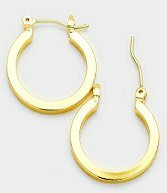 Cartier designer gold filled hoop earrings are approximately 3/4 inch in diameter. Fashion quality (less than perfect) hoops with a pretty brushed/matte gold filled finish. Niobium earpins make them safe for us to wear. Daytime wear only. Available on my Sale page for just $30.00. Soft silicone earring backs/clutches are perfect for post earrings. I get the most beautiful Lab Grown Gemstones the world has to offer! Absolutely exquisite. The brilliant color of these Gemstones are what make the earrings so very special. 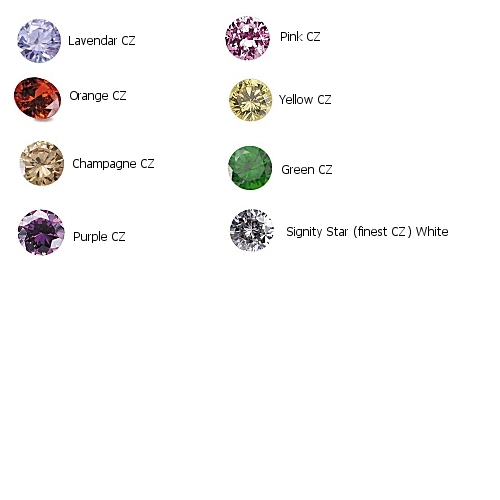 Gemstones are available in Champagne CZ's, Lab Ruby Corundum, Ice Blue Quartz, Lab Aqua Spinel, Hydro Cognac Citrine, Hydro Emerald, Cubic Zirconia and Amethyst CZ. They are set in a Sterling Silver Wrap Setting (or Gold Fill upon request) and dangle from Unanodized Titanium (Ti) or Niobium (Nb) hooks, with a Sterling Silver Accent bead (or Gold Fill) to bring together the design. Earrings hang about @ 1 Inch from the piercing. Pure Grade-1 Titanium or Niobium Left & Right Triangle Earscrews. Triangls are @ 6mm tall and wide. Unanodized (natural silver-gray color) Niobium (Nb) or Titanium (Ti) or Anodized Niobium (bright vivid colors). 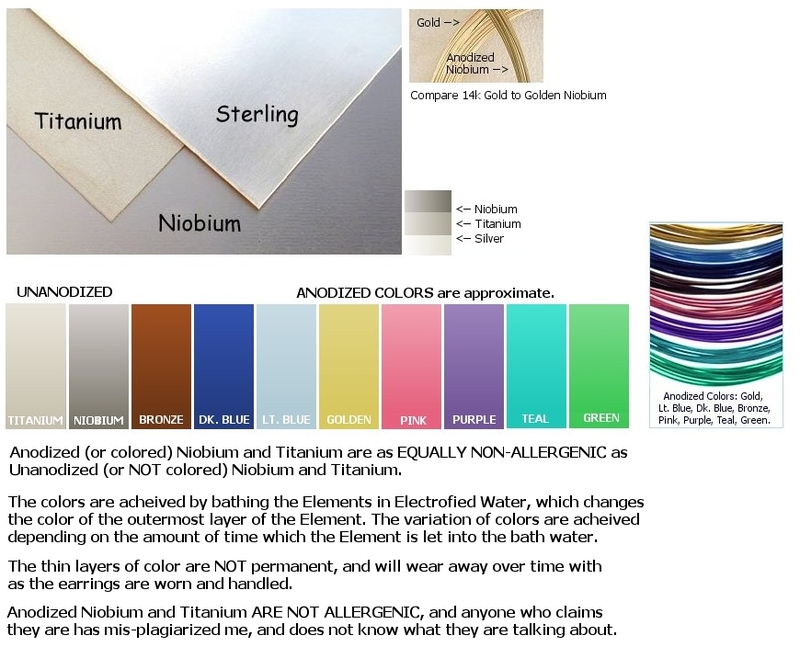 To see a color chart of Titanium and Niobium colors, click on the "Titanium and Niobium" link, under the "Color Charts" heading of the left navigation bar. Clutch backs are included. Perfect starter/sleeper/healing earring Earscrews "screw" into the piercing and don't require clutch backs at all. 21 gauge. 5mm Gemstone Dangles in Silver wrap settings. Unanodized Titanium or Niobium hooks with Silver beads and Gemwraps make this classic earring perfect for any occasion. The brilliant color gems that I have gotten from all over the world, to set in these earrings are what makes them so special. Choose from: Amethyst, Swiss Blue, Emerald, Canary or Pink CZ; Raspberry Ruby, Green Quartz, or Signity Star. Click on the picture for a detailed view of my beautiful gemstones you can choose from. Earrings hang about @ 1 Inch from the piercing. Other sizes and color options are available upon request, including gold. 4mm Crystals in Surgical Implant Grade Titanium Bezel Cup Settings. These are already set by the manufacturer, with Diamond White color crystals or Pink Sapphire colored crystals (not swarovski). Post length fits an average earlobe thicknesses up to 7mm. Surgical Implant Grade Titanium is alloyed, and recommended for healed piercings only. Great Price! Donuts are available in beautiful colors, in 4mm or 6mm sizes. Change the Donuts for a whole new look! Extra Donuts are available to purchase seperately. Perfect starter/sleeper/healing earrings! Clutch backs included. Posts will be made at a "regular" length, unless you request "long" or "custom" posts. Gold Fill CZ Studded Hoops with Niobium (Nb) Earpins. It's getting harder and harder to find Goldfilled CZ Hoop Earrings these days, but take a look at these beauties! Gold Filled Micro Pave studded with beautiful CZs in a double row and an Inside Outside Design, so that everyone looking at you sees all of the CZs! They measure @ 1+3/4 inch in diameter by 4mm in width. Niobium Earpins to match, so only pure elements touch your sensitive skin! Snap down closure makes them easy to put on and take off. Beautiful and Unique For healed piercings and daytime/dry wear only. Introductory Price! These are Top Quality Genuine Black Onyx Tiles (flat top), and are epoxy set onto Pure Grade Titanium (Ti) or Niobium (Nb) Flat Pad & Post settings. Clutches are included. Titanium settings are available in regular length posts only ... Or you can order these earrings with custom "Hand Made" Niobium Settings/Posts (your choice). Jewelry which is epoxy set, should not be worn into water, or it could loosen the gemstone from it's setting. For this reason these earrings are NOT appropriate to be used for "healing earrings", which must be worn 24/7, even into the shower. 8.5mm Genuine Green/Silver Tahitian Pearl Earrings! Tahitian Pearls are the very best that money can buy! And now you can wear them too, when they are set on Pure Grade Titanium (Ti) or Niobium (Nb) Posts & Settings! Don't wait long to get these, light color Tahitian Pearls are super Hot right now .. they won't last long. These stunning Silver Pearls have a green overtone, are Near Round, AA+ quality, and have clean fronts and only slight inclusions (if any) on the sides or backs. The pair you see is the pair you get. Clutches are included with these Post Earrings. Titanium earrings are available in "Regular" or "Long" post lengths, OR get a "Custom" post length, for just $10.00 more. Niobium earrings are completely made by hand, so there is no extra charge for "custom" fit. (choose your post length in the drop down box below). 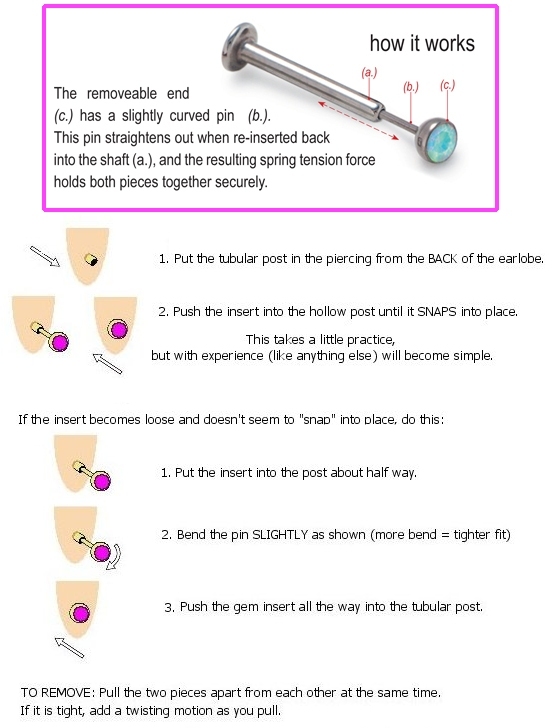 To order a "custom" post length, see my "Measure Earlobe Thickness" link under the "How To" section of my left navigation bar, for instructions on how to "measure" your earlobe thickness. Give me your actual "Earlobe Thickness" Measurement, in the drop down box below, or the note section of the check-out page. Pearls and other jewelry which is epoxy set, should not be worn into water, or it could loosen the pearl from it's setting. Additionally, water can damage the surface of the beautiful nacre of the pearls. For this reason, these earrings aren't appropriate for starter/sleeper/healing earrings. Gorgeous Genuine Blue Tahitian Pearls, Titanium/Niobium Earrings! 9-9.5mm Genuine Blue Tahitian Pearl Earrings! Tahitian Pearls are the very best that money can buy! And now you can wear them too, when they are set on Pure Grade Titanium (Ti) or Niobium (Nb) Posts & Settings! These "Blue-ties" are Near Round, AA+ quality, and have clean fronts and only slight inclusions (if any) on the sides or backs. The pair you see is the actual pair you'll get. Clutches are included with these Post Earrings.